Bathroom Tiles San Fernando: Are Wet Baths Right for You? Depending on how familiar you are with tiny houses and urban Asian living, you may or may not have heard about wet baths. The term means almost exactly what it sounds like, but still, many people find it difficult to grasp when or how to properly use these efficient spaces to transform their living situation. What are Wet Baths and Why Should I Care? Simply put: A wet bath is a bathroom in which just about everything can get wet without any damage. While this may sound like all bathrooms, most bathrooms are actually only waterproofed on the floor and around the shower or tub, and even then water can still cause damage if it were to sit in any one area. The wet bath features no wood trim and likely no sheetrock or painted areas, instead opting for fully tiled walls and floors that prevent water from leaking into the walls or floors. In a wet bath, your entire bathroom is a shower. This is a major benefit to those looking for space efficiency, as a shower head and the associated knobs take up almost no space, which allows you to have a much more open space as possible. When you don’t have to worry about including the raised lip, curtain, or door for a shower, it suddenly becomes a lot more possible to comfortably maneuver in a small space. Many people love the freedom to move about during their shower, rather than being confined in the traditional rectangular shower areas we’re all used to; just make sure the bathroom door has a good lock on it! For a tiny house, wet baths are all-but necessary, as they allow the amenities of a 300+ square foot bathroom to fit into under 100 (or even 50) square feet. While this may not be what you have in mind for your master bathroom, you can easily consider creating two wet baths out of one medium-sized bathroom to allow for guests or kids to have their own bathroom space where sharing was once the only option. If you’re looking to add living space to your home in the form of an additional or basement finishing project, consider doubling up your bedrooms and bathrooms by using these space-efficient bathrooms. While this is the most common application, it can also be applied to much larger, high-end bathrooms to create a spa-like area where a soaker tub, shower, and even hot tub can exist in one open, tiled space. These larger areas create a truly impressive presentation and allow the wet bath and traditional sheetrocked bathroom to shine independent of one another. The best applications combine the non-wet portions of the bathroom (vanity, water closet, etc) to intermingle with dressing and even master closet space, while the bathing area will feel isolated and resort-like. The major strength of a wet bath is, of course, space efficiency, but some interesting benefits can also be enjoyed. Because of the confined nature of the “wet” area, bathing pets and small children is made much easier; because they can splash and shake off wherever they like, all you need is a bathing suit to easily clean them off without any worry of damages. Other benefits are a little more eclectic, such as the design potential that comes from the tiled walls and flooring, which allow for some truly breathtaking creativity. Since wet baths are most often used in tiny bathrooms, splurging on one or more nice bathroom tiles will not break the bank. Many people that have wet baths will tell you that one of the biggest benefits that you may never have considered is how ridiculously easy it is to clean and maintain the bathroom. With a shower wand in hand, you can just turn on the water and rinse out the entire bathroom during your shower, preventing bathroom buildup and grime before it can begin. There are a few drawbacks to wet baths, chiefly that many people find it too strange to shower without separation. In small bathrooms, the toilet and sink are often right next to you (even if the space is big enough to comfortably fit), which makes some people a little squeamish. Another drawback is one related to small bathrooms in general, which is the lack of space for things like a bathtub; while possible in a wet bath, many do not feature a bathtub or the space to add one. 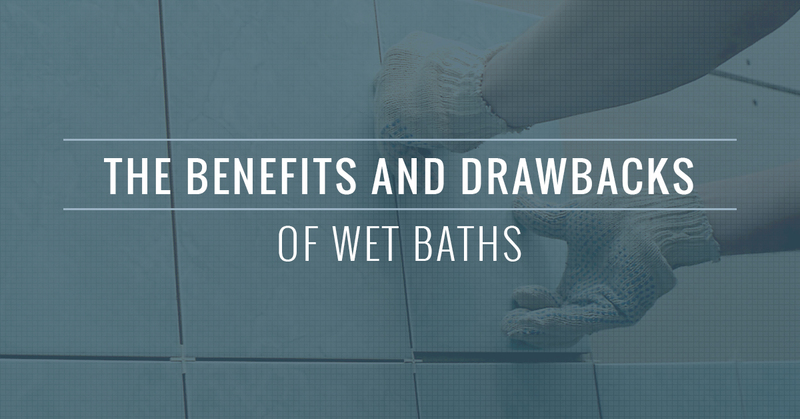 The final drawback is the slip hazard that can be present in especially small wet baths; after all, a bathmat goes against the idea of the wet-safe area. For older people especially, wet baths can pose a fall hazard. Regardless of whether or not your tile goes floor-to-ceiling, you’ll need bathroom tiles for your wet areas. You can find the best selection and service available in Simi Valley, San Fernando, and Thousand Oaks at Transworld Tile. We’re proud of our 30+ years of service and commitment to local families and would be more than happy to help you find the perfect tile for your home. Request a free quote online or check out our selection in person!